Booker Ervin & Pony Poindexter: Gumbo! A strange combination of sorts, this release gathers two disparate sessions whose only apparent common denominator is the incredible Booker Ervin. Ervin’s name on the bill should be a signal to most jazz fans that the contents contained herein are worthy of their attention. The added bonuses are many as well and include a brief, but tantalizing meeting between the Texas tenor titan and forward-thinking organist Larry Young. Poindexter is something of an enigma. He never really made it big beyond his hometown of New Orleans, but based on his intriguing work collected here it’s difficult to discern why. Matching an equal facility on soprano and alto with a deep passion for hard bop and Dixieland, Poindexter opted for a program of tunes that would conjure the sights and sounds of his birthplace. Grey’s tailgate trombone and Ervin’s booting sax help him toward these ends and the rhythm section fronted by bop scholar Gildo Mahones keeps things moving at a percolating pace. A mystery conga player is also attendance beginning on the soulful “Creole Girl” which tips its hat to the Herbie Hancock-inspired 60s sound. “4-11-44” continues along the same path and is awash in gris-gris grooves compliments again of the rhythm section and most noticeably Tucker’s thick-fingered bass lines. Tucker’s taut figures also shine on the rousing rendition of “Wade In the Water” which takes the session out. Several of the tracks including “Moody’s Mood” feature Poindexter’s vocals, which are fairly forgettable in comparison to his musicianship. The Larry Young session appended to the end of the disc is as frustrating as it is revelatory. The frustration comes with the brevity of the meeting, a mere four tracks and one alternate, but what’s included is by and large well worth hearing. The date predates Young’s ascendancy to the title of ‘Coltrane of the organ,” but his dense, meaty lines still push the envelope at this early stage and goad Ervin into some thrilling solo passages. Thomas gives sufficient, if sometimes clunky, support and the three burn through the handful of tunes with a surefooted groove in tow. Though this disc does consist of a rather bizarre match of sessions the music is uniformly entertaining and should be investigated, particularly by listeners who harbor an appreciation for Ervin. Collective Booker Ervin- tenor saxophone; Pony Poindexter- alto & soprano saxophones, vocals; Al Grey- trombone; Gildo Mahones- piano; George Tucker- bass; Jimmie Smith- drums. Larry Young- organ; Jerry Thomas- drums. 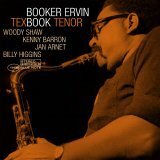 Booker Ervin & Pony Poindexter CD/LP/Track Review Booker Ervin Derek Taylor Prestige Records United States Gumbo!